Against the backdrop of seemingly endless challenges across the world, United Nations Deputy Secretary-General Amina Mohammed told a conference of development-minded partners in Nigeria that “no country, no region” could tackle them alone. Under the theme “Building effective partnership for accelerated progress towards the Sustainable Development Goals”, the two-day conference aims to fortify partnerships to fast-track implementation of the global goals, which each country is adapting to reach ambitious targets on poverty and hunger eradication, among other challenges. 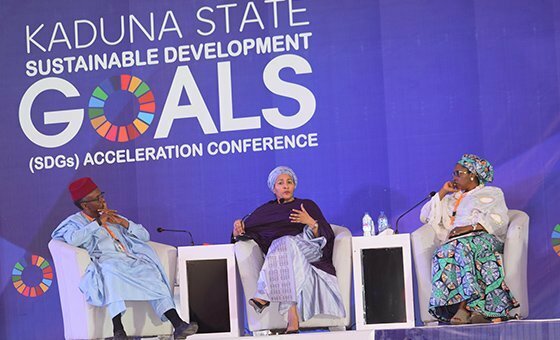 United Nations Deputy Secretary-General Amina Mohammed (center) at the Kaduna State Sustainable Developmen Goals (SDG) Acceleration Conference on 22 January, 2019., by UNIC Lagos.